Living With Cancer: Is it melanoma? 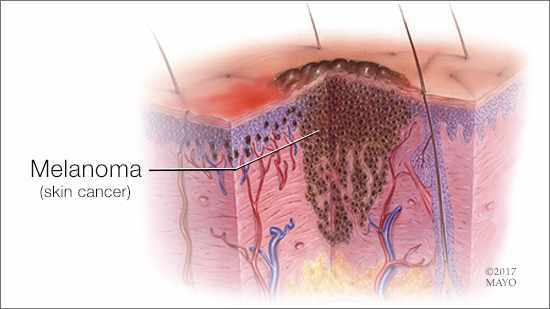 Melanoma, the most serious form of skin cancer, is often curable if you find it early. The exact cause of all melanomas isn't clear, but exposure to ultraviolet (UV) radiation from sunlight or tanning lamps and beds increases your risk. These images and the ABCDE melanoma test can help you determine if an unusual mole or suspicious spot on your skin may be melanoma. Living with metastatic breast cancer can be stressful, but you don't have to go through it alone. Support may come in many forms — your health care team, your friends and family, and online forums with people who share your fears and concerns. What works best for you depends on your own personality and unique situation. Here are some possible ways to find the right kind of emotional support for you. Cancer surgery — an operation to remove part of your body to diagnose or treat cancer — remains the foundation of cancer treatment. But the prospect of surgery may make you feel anxious. Help put your mind at ease by learning more about cancer surgery and how and why it's used. Mayo Clinic Minute: Can your child hear the teacher?